When you visit an art museum, a comment you’ll often overhear is “what time are we supposed to be back on the bus?” Other popular topics include the lines for the rest rooms and the prices in the cafeteria. Occasionally, though, I’ve heard museum visitors say stuff about the art they were seeing that was so perceptive I’ve wanted to high-five them. The poet W.H. Auden had one of those brilliant insights, expressed in a poem he wrote in the late 1930s. It’s called Musée des Beaux Arts. You probably remember the Greek myth about Icarus, whose father Daedalus made wings for himself and his son. Wax was a component of the wings, and when Icarus flew too close to the sun, the wax melted and Icarus plummeted into the sea. If a painting is titled, say, “Madonna and Child”, it’s not unreasonable to assume that the composition will prominently include Mary and the baby. That’s one of the odd things about the Icarus painting, though: He’s not the central figure. In fact, you have to look closely at the painting to see Icarus at all. In the lower right corner of the picture, his flailing legs are sticking out of the water. About suffering they were never wrong, The Old Masters: how well they understood Its human position; how it takes place While someone else is eating or opening a window or just walking dully along; How, when the aged are reverently, passionately waiting For the miraculous birth, there always must be Children who did not specially want it to happen, skating On a pond at the edge of the wood: They never forgot That even the dreadful martyrdom must run its course Anyhow in a corner, some untidy spot Where the dogs go on with their doggy life and the torturer’s horse Scratches its innocent behind on a tree. In Brueghel’s Icarus, for instance: how everything turns away Quite leisurely from the disaster; the plowman may Have heard the splash, the forsaken cry, But for him it was not an important failure; the sun shone As it had to on the white legs disappearing into the green Water; and the expensive delicate ship that must have seen Something amazing, a boy falling out of the sky, Had somewhere to get to and sailed calmly on. 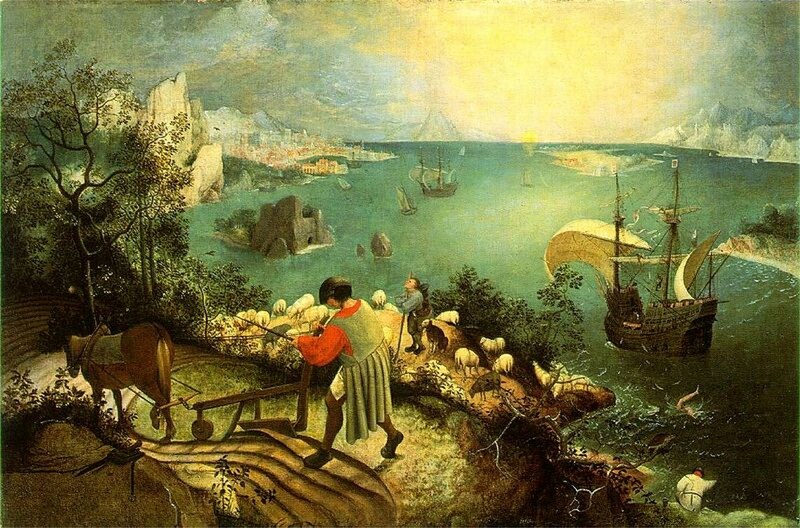 This entry was posted in Art, Language and Literature, Uncategorized and tagged Landscape With the Fall of Icarus, Musee des Beaux Arts, Pieter Bruegel, W.H. Auden. Bookmark the permalink. I read this carefully over vacation. This piece of art along with your commentary provoked so many thoughts that currently I am unable to leave a succinct comment. Suffice to say my comment would wrap itself around the differences between the Western & Eastern views of cosmology where God and myth is separate from man in the former and inclusive in each man in the latter. How wondrous this, how mysterious! I carry fuel, I draw water.